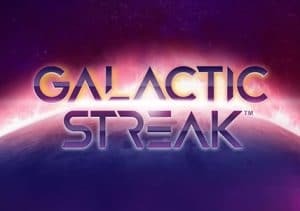 Head off on an interplanetary mission in Galactic Streak, a space-themed video slot to hit the shelves from Playtech. It’s a simple 4 reel, 20 payline win both ways video slot that comes with plenty of multipliers and a free spins round. Play on your PC, tablet or mobile device from between 20p and £40 per spin. With an ambient electronic soundtrack and bold colourful visuals, the design in Galactic Streak is top notch. Set against a deep space backdrop, the reels feature 8 standard planet symbols. The best of these are the purple planet and ringed orange planet. Both of these will get you 2.5 times your bet if you land 3 or 4 in combination. Helping to create winners is the flaming sun which is the game’s wild. Land 4 of these and you’ll pocket a payout of 6.25 times your bet. As usual the wild replaces everything apart from the scatter. Multipliers are central to the action in the Orbit feature. Land a winner and those symbol positions will gain a multiplier for the next 3 spins. This starts at 2x but can increase if a new winning combination hits there. In that case, the multiplier is boosted by 1 and the number of spins they’ll stay there for resets to 3. Multipliers can reach up to 10x here. Hope to land a winner on 2 or more multiplier positions on the same spin as the multiplier values are added together for an even bigger boost. The galaxy symbol is the scatter. Land 2 of these on the same spin and all the multipliers on view receive a 1x increase. Landing 3 scatters triggers the Galactic Free Games feature. On offer here are 10 free spins. Any multipliers on show on the triggering spin are carried forward to the free spins and remain in play throughout. They won’t reset but they can increase to deliver even bigger potential rewards. There isn’t a massive range of extras on offer in Galactic Streak. That’s no bad thing here though. The repetitive gameplay matches the minimalist design perfectly. Repetitive doesn’t mean boring here either. The multipliers can deliver plenty of action especially when you trigger the bonus round. Simple it might be but we found plenty to enjoy in this space adventure. Get on a roll with the multipliers and Galactic Streak can deliver some out of this world action. If you like the space theme, Iron Girl by Play ‘N Go is highly recommended.